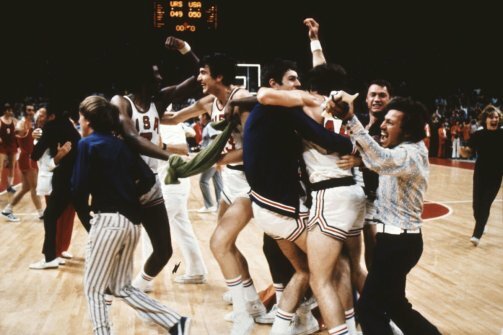 In the chill of the Cold War, the 1972 U.S. basketball team went up against the U.S.S.R.—and was cheated out of a gold medal. Former representative Tom McMillen, who was on the team, offers a peace plan. Nearly 40 years ago, shortly after midnight on Sept. 10, 1972, the U.S. men’s basketball team, of which I was a member, took the floor in a sports hall in Munich to play the Soviet Union for the gold medal in the Olympics, a game that would be broadcast worldwide. Everyone in the Olympic Village had witnessed the horrifying events that had played out just five days earlier—the hostage-taking of Israeli athletes by Palestinian terrorists in which two Israelis were killed. Later, we watched as three helicopters lifted off from the Olympic Village, carrying the hostages and their captors toward the airport. I hoped, as everyone did, that the crisis would end with the Israelis safe and freed unharmed; instead, all nine were killed in a rescue attempt. Like most of the world, I was deeply shocked at the deadly intrusion of politics into sports. In the aftermath of the attack, the mood at the Games was sad and somber. The tragedy was never far from our minds, but none of us could have imagined that, in the years since, the kind of brutal attack we witnessed would become all too familiar—that terrorism would spread and scar our lives. But in 1972, it was the Cold War that was on people’s minds. It was at its height—the U.S. and the Soviet Union threatened each other with thousands of intercontinental missiles. Although President Richard Nixon and General Secretary Leonid Brezhnev of the Soviet Union had signed Salt I, the historic arms-limitation agreement, in May, the rivalry between the U.S. and the Soviet Union was at its peak. I knew the Olympic Games were not free from politics, that the antagonism between the two superpowers played out in sports such as skating and wrestling. But I thought of basketball as a safe zone, with the outcome of the game depending on what I thought were clear-cut rules, and I was happy to put politics aside and suit up for the game. Little did I realize I was about to find myself in the middle of a Cold War skirmish. Although we were the youngest U.S. Olympic team ever, competing against a very mature, professional Soviet team, we were favored to win. The U.S. had dominated men’s basketball since its inception as an Olympic sport in 1936, had won every gold medal up to the 1972 games, and we all felt tremendous pressure to maintain the winning streak. We desperately wanted that eighth-straight gold medal. When the game began, the Soviets, with their deliberate style of play, dominated. They led by five points at the half, and, with 10 minutes to play, were ahead by 10 points. With six minutes remaining, our team began to press and hustle, and with only three seconds on the clock, we were down by just one point. Doug Collins, now coach of the Philadelphia 76ers, had been fouled and was ready to take perhaps the two most important free throws in the history of the game. Doug made both shots. That put the U.S. up 50-49. Three seconds left. The Soviets put the ball in play, made a wild shot at the basket, and the buzzer went off. Then everything got crazy. We thought we had won, but then the referees let the Soviets make another inbounds play with one second on the clock. The buzzer rang again; we’d won again! American fans crowded the floor in celebration. I saw R. William Jones, then the secretary-general of the International Basketball Association, come out of the stands. He was holding up three fingers. I had no idea what he was doing but learned later he was telling the officials to put three seconds back on the clock. As Jones himself would later admit, he had no authority to make such a decision. Once the court was cleared and some order restored, the Soviet player Ivan Edeshko was ready to put the ball in play. A referee waved me back as I guarded Edeshko. No rule said I had to move, but my coach, Hank Iba, had said earlier that the world was out to get us. Don’t expect a fair shake. So I stepped back, worried I’d get a technical foul if I didn’t. Edeshko was then clear to make a pass down the court to Aleksandr Belov, who made a layup. U.S.S.R. 51, U.S.A. 50. In the ensuing chaos, we returned to the locker room, still not understanding what had happened, and when told to appear for the awards ceremony to accept the silver medal, we refused. Afterward, the U.S. Olympic Committee protested the Soviet victory, but a group composed largely of judges from Soviet bloc nations rejected the appeal. The U.S. team did not accept the silver medals. We still haven’t accepted them. I believed then—and believe now—the U.S. team had victory taken away from us, that our basketball game ended up as proxy war between two superpowers. Forty years later, the Berlin Wall is down, the Cold War has ended, the borders in the former Soviet bloc countries are open. Relations between the U.S. and the former Soviet Union are not always smooth, but our political détente holds. Perhaps it’s time for easing of tensions about that controversial game as well. Ten years ago, I asked the IOC to award the 1972 U.S. team dual gold medals to rectify the errors of that game. The precedent for my request was the figure-skating scandal at the 2002 Winter Olympics, which led the IOC to award duplicate gold medals to the silver-medal winners, Jamie Salé and David Pelletier from Canada. The IOC decided that the pair came in second not because of their performance but because a judge had been unduly pressured by one of the sport’s governing bodies. I argued that Jones’s unauthorized intervention in our game brought similar pressure upon the officials. I never received a response to my request. But when I brought up the issue with my former teammates, all were willing to accept dual medals. We members of the U.S. team have a 40th reunion scheduled for August. I intend to propose a “grand compromise” then. If the members of the Soviet team agree to the awarding of dual gold medals to our team and the IOC approves, the U.S. team will donate our medals, worth a great deal as sports memorabilia, to a Russian charity for orphaned children. With the help of other donors, we could raise millions of dollars to help build a bridge between our nations. This gesture could bring us closer together—and could show that, even in a world increasingly marked by partisan strife, sportsmanship and good will can sometimes trump geopolitics.